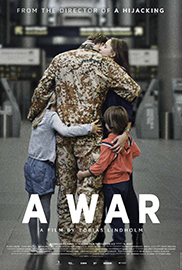 Afghan War Blog: Movie Review - "A War"
Movie Review - "A War"
I recently had the opportunity to watch the movie entitled - A War. This Danish film about the troops of Denmark deployed to the volatile Helmand province is realistic, emotional, and riveting. The movie presents the issues combat leaders face when charged with protecting the Afghan population, defeating the insurgents, and ensuring that their troops return safe from the battlefield. In addition, the movie shows the problems experienced by the parent left at the home front - caring for children missing their Dad, worries about their spouse in the war zone, and problems of adapting to life without the second parent in the home. The film explores the morality of war as well; providing us insight as about split-second decisions that combat leaders make in the heat of combat that have ramifications down the road. Read my review of this movie at the link below.